The most important concern of anyone using a moving company is the cost to hire movers. So, How much does it cost to hire movers near me? Knowing how much movers charge on average will help you plan your move in the best possible way. Yes, there are many important things to consider, remember, and keep in mind when moving house but nothing can possibly compare to knowing how much moving companies charge in various move related scenarios. As it turns out, the cost to hire professional movers will effectively solve the ever-present dilemma of whether you should hire a moving company or do it yourself. The cost of moving depends on a number of important factors, including the type of the move itself – is it a local move or a long distance move? As you might suspect, there are specific moving company fees that apply to each one of these types of moves and determine the final cost of movers. And of course, knowing what to expect in advance is definitely a bonus a good start to your moving adventure. Oversized Items. The necessity for professional moving services will also be dependent on the size of your rooms and the quantity and nature of your household items. For example, if you own too many specialty items – things that are usually very difficult to pack and move then it becomes clear that you can’t possibly do it all without the timely assistance of the pros. How are you supposed to move your valuable piano without damaging it or hurting yourself? The self-move risks can be too many to just ignore them. Access. Access of items and actual layout of your residence is an important factor when pricing how much movers cost. If you haven’t moved before, and you have a 4 bedroom house for instance, you should definitely hire a professional moving company regardless of the access simply because this is just too large of a move for a civilian to partake in one day. Thus, you will save yourself the stress of having to organize all stages of your move, including packing your belongings from each room in labeled boxes, and then – the grueling job of carrying, loading and unloading all the heavyweight boxes and large and heavy furniture all the while burning hours of what is most likely a weekend in the spring or summer. Additional Services. It’s all about the general cost to hire movers, isn’t it? You want to make sure your hard-earned money is well-spent on a top rated moving company. Many movers will offer additional services like moving and storage, packing, and coverage. What’s the cost to hire movers for a local move? 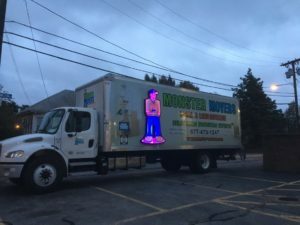 Local movers charge by the hour, so based on average local moving costs, hiring 2 men and a truck will cost you between $110 and $140 per hour. When moving in town, moving labor only (without the moving truck) will cost about $80 to $90 per hour. Every single dollar counts regardless of whether you’re organizing a local or cross country move. Depending on where you live, state and metro area, the rates and the overall local moving cost will vary. 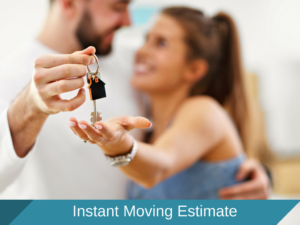 You will be charged an hourly rate for the time movers spent working on your move. This hourly rate applies whether the movers are wrapping, loading or driving from point A to point B. Travel fees may also apply depending on the pickup location. In many cases, this fee could be negotiated between the moving company and the client depending on the travel distance to the customer moving location. You may also be charged for packing materials. Make sure you keep this in mind when you ask them to estimate your moving costs. You can use our local moving cost calculator form on the top of the page as a cost estimator about the entire move. Moving out of a studio apartment with the help of 2 local movers will cost you around $400 if the entire loading, transportation and unloading operations are complete within 3-4 hours. Moving out of a 2-bedroom apartment or house (approximately 1000 square feet) will probably cost you between $800 if 3 local movers complete the local relocation job in 5-6 hours. If you’re moving out of a 3-bedroom apartment or house (roughly 2000 square feet), expect to pay $1200 for a local moving crew of 4 members who manage to finish the local move in about 8-9 hours. If your home is larger than the above examples, then the moving price can go up significantly. Still, your best option to have a better idea of how much local movers cost is to use the local cost calculation tool we offer so that you can set your moving budget the right way. Speaking of your moving budget, let’s not forget the additional local moving costs which you should be prepared to pay. In most cases, be ready to pay an extra $25 for each additional professional helper you hire. Most local moving companies will gladly offer you the extra service of packing and unpacking your household items. If you decide to take advantage of that offer, expect to be charged between $25 and $35 per hour for the additional service. You won’t need to pay extra for the packing materials as they are usually pre-included in the price. If you’re happy with the way your local movers handled your relocation, you may as well reward their efforts by offering them an appropriate tip. Tipping is always appreciated and is a good way of saying, “Great job, guys!”. As a rule of thumb, tipping for local moving goes around $5 per mover per hour, or approximately 10-15% of the total moving cost. Of course, you can always tip your local movers more if you’re really satisfied with their job. Just don’t ever commit the rookie mistake of giving the lump sum to one person – instead, hand each crew member their share. What’s the average cost to hire movers long distance? In order to provide accurate price estimation, top rated movers will do an in-house inspection to calculate the costs and assess the risks. Yes, long distance costs are calculated by weight or in some rare relocation cases – by cubic foot of the items for transportation. Most cross country moving companies will charge you based on the weight of your shipment and the distance to your new home but will probably charge you for a number of additional services and various fees as well /see below for more information/. It’s important to know that long distance moves are calculated on a case by case basis because the moving price depends on too many factors. To learn your moving cost beforehand, you need to request an in-house estimate. Then, a company representative will visit your home, assess the move related situation carefully, and then give you a moving estimate. To learn more about moving estimates and namely – which price estimate /binding or non-binding/ you should select in your particular case. There’s no better way to have your long distance moving costs estimated than to contact a few top rated cross country movers and ask them for on-site estimates. Having a binding estimate will guarantee to some extent that the final long distance moving cost will not exceed the estimated amount. Rule out any moving company that will not give you a visual estimate, and insist on a binding or not to exceed estimate. CAUTION: Should you happen to receive a price estimate that is way lower than the rest, proceed with caution as that could be a sign of moving fraud. Read how to protect yourself from moving fraud (U.S. Department of Transportation). Still, take a look at these examples to get an idea about the cost of a cross country move – an approximated value, of course. Moving out of a studio apartment (approximate weight of goods: 1800 lbs., distance to new home: 1000 miles) should cost around $1800. Remember that all these example prices are only approximate. To learn how much you will have to pay for the professional moving services you hire, your best bet is to request on-site surveys from reputable movers that end with the issuance of accurate price estimates. In summary: How much does it cost to hire professional movers? How much does it cost to hire movers for a one bedroom apartment? Local movers charge around $35 per hour per mover. It should take 3 movers roughly 4 hours to move a 1 bedroom apartment locally, so about $300 for labor only. When moving long distance, the price can jump to around $2000 for an average weight of 3000 lbs. 1 bedroom apartments weigh approximately 2200 lbs. to 3200 lbs., but the household items you decide to move out from your 1 bedroom apartment may weigh much less or much more than the specified average weight. To save big from the upcoming transportation costs, you must inventory your items and reduce the number of your possessions only to the absolute minimum. Downsize! Every additional item you choose to take with you will cost you extra money. What’s the price to hire movers for a two bedroom apartment? Local moving companies charge around $35 per hour per mover. It should take 3 movers roughly 6 hours to move a 2 bedroom apartment locally, so about $450 for labor alone. When moving long distance, the price can reach around $3500 for an average weight of 5000 lbs. 2 bedroom apartments weigh somewhere between 5000 lbs. to 6000 lbs., but a single specialty items may tilt the scales one way or another To avoid finding yourself with too little time to react accordingly, you must start packing up your home as early in the preparation stage as possible. Start preparing the rooms which are the hardest to sort out and pack (storage areas, kitchen), and then work your way towards the easiest rooms to pack (bathroom, bedroom). How much does it cost to hire movers for a 3 bedroom house? Short distance movers charge around $35 per hour per mover. It should take 4 movers roughly 9 hours to move a 3 bedroom house locally, which is about $900 for labor alone. When moving cross country, the cost can go around $6300 for an average weight of 9000 lbs. Please note that your belongings may weigh more or less than the above estimates. It’s a good idea to ask the moving company to be present when the moving truck is being weighed on a certified scale. Household goods in 3 bedroom houses can easily amount up to 9000 pounds in weight. As mentioned above, save money by purging your home of any items which you no longer want and will not need in the foreseeable future. If you haven’t used an item in more than a year or if your items don’t bring you joy – chuck them! If you still can’t find the answer to your “How much does a moving company cost?” question, get your free moving quote now. It’s really hard to calculate in advance the total relocation cost when you hire a professional moving company for your local or interstate move. And yet, it’s very useful to have a better idea of how your moving budget will be affected by this life-changing event. 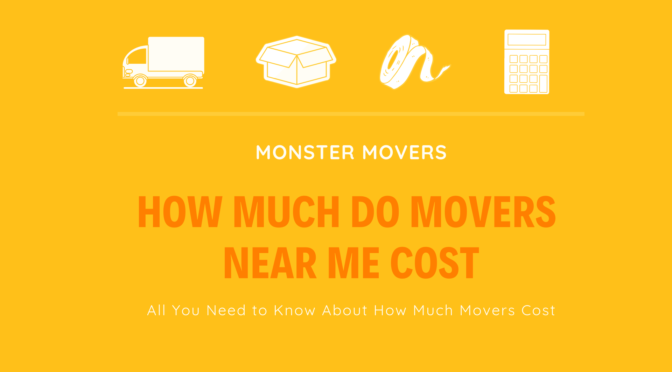 So how much will movers near me cost you ask? 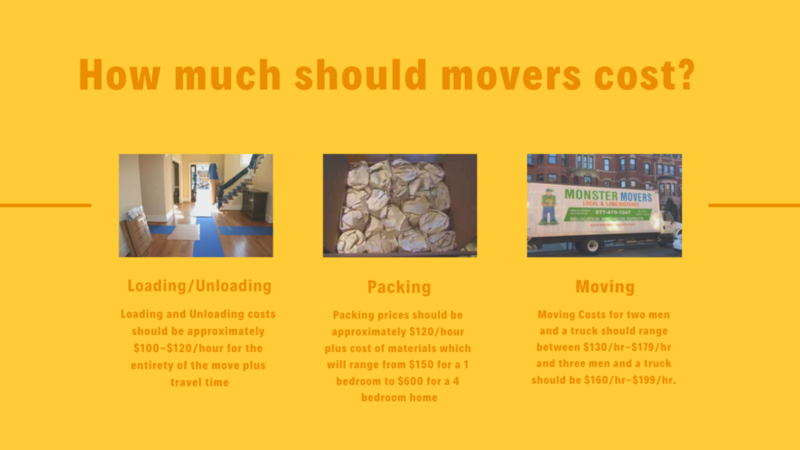 Packing: how much does it cost to hire movers to pack for you? Local movers charge about $35-$45 per hour for the extra service of packing up your home. For long distance moves, full service movers and packers will quote you a price depending on the size of your home, and the number and nature of the items. Packing on your own can save you a good amount of money. However, specialty items can easily prove too much for you. To save money, you are advised to pack whatever you can by yourself or by asking a bunch of good friends to help you out. To save even more money, you should seriously consider finding packing boxes for free and, whenever possible, using alternative materials to packing paper and bubble wrap. Yes, packing on your own will let you lower the moving costs but make sure you assess the situation properly as specialty items or extra fragile or expensive possessions should be left for experienced professional packers. Movers are known to charge their customers for a variety of special circumstances that may be presented in a move. For example, if you have many heavy or bulky items for moving, your moving company can charge you extra for their laborious handling. Also, you are expected to pay a long carry fee if the distance between your front door and the moving truck is greater, or even an elevator fee if your hired laborers are forced to go up and down many flights of stairs due to the lack of an elevator (or a non-operational one). Want to have an extra pick-up along the route to your new home? It’s called an extra stop charge. Need to have your items placed in storage before they are delivered to your new place? Here’s a storage fee for your delayed delivery. Depending on your specific requirements and needs, be mentally and financially ready to pay extra for each additional service you request from your movers. Research well your insurance options when getting ready to move out of your home. You will receive basic protection for your household goods the minute you sign your moving contract. The good news is that you don’t have to pay for the so called Basic Limited Liability Protection. The bad news is that its coverage of 60 cents per pound per article is, in most moving instances, simply unacceptable. Discuss with your mover other reasonable options of protection, including purchasing a genuine moving insurance with their help. Alternatively, you can contact a third party insurance company and arrange a proper insurance for your valuable possessions. Fancy cutting down your moving costs the way you like it? Another factor that can great affect your moving budget is the selection of the moving date. How early you book your local or long distance move is important for lowering your moving costs, but timing your reservation right can be hugely beneficial to your relocation budget. During the height of the moving season (May – September, weekends, holidays, first and last days of a month), your moving company can charge you up to 20% more than their standard rates. Therefore, if you can afford to be choosy about your moving date, avoid the busiest relocation periods mentioned above so that you keep your moving budget from going over the set limit. Moving is not that fun, but it can be done professionally and without hassle when you hire movers. Think about the size of your move and all the other details in order to decide whether you will hire a professional moving company. Budget and time constraints are major factors, however, if you haven’t moved before, think about what’s more valuable for you – your money or your health.